It’s winter, and we’re hiking across snow to the falls. Boots tramp over a trail hardpacked by daily visits. Bare limbs reveal the hillside, bereft of the cover leaves afford the trail in summer. There’s something about the barrenness of winter that strips our souls. In a way, it’s a time to use this vulnerability to heal. We are open. I shuffle my snowboots in single file with a group of chatting and giggling women. I smile because we were supposed to walk mindfully. But that does not mean silently, right? We’re here to heal at the Ripley Falls. In this glorious mindful moment, my world is white, the snow muffling my steps and sharpening my sense of connection. Clear waters gurgle over billion-year old bedrock. At the falls I let go. Down, down, down, I drop, falling over backward, this moment captured in a snowglobe somebody has bought and shelved on a mantle in a universe far away — look, you shake up the globe, and the women at the falls fall over. We fuss over falling. We don’t even want to trip. It smudges our knees, tarnishes our shoes. Falling means we failed. Falling means we didn’t do it right. Falling carries such societal shame that many people spend a lifetime making certain they don’t ever fall. Lose weight, take a pill, regrow lost hair, make more money, and whatever you do don’t fall from grace. Falling is not as hard as we think it will be. I let go, fall backward and the snow catches me. I’ve fallen, so what do I do? I laugh, feel the cold against the back of my wool coat, ignoring the sting of snow that creeps into my mittens, and I fling both arms wide. I make a snow angel. And all around me, I hear the water churn gently over rocks and the sound of other women falling. No, falling isn’t as hard as they tell us it will be. It’s the getting back up that’s a bear. The struggling, slipping, falling again. A hand followed by another reach down and with help, I regain my feet. Alone, I might have floundered. Falling, if it has a core lesson, teaches us that it’s easy to do, and hard to recover from unless we have help. That winter hike to Ripley Falls will etch itself in my memory box. It was the conclusion of a retreat at the Ripley House of Healing owned by my friend Cynthia May Drake. She helps veterans, their families, women in transition, and anyone coping with grief and loss. The women who gathered that day I now also count as friends. We’ve seen each other many time since and I always recognize their hands. I’ve attended several workshops and many Magnificent Mondays with Cynthia. She honors my literary art and welcomes me to share it during these gatherings. That day, after the winter retreat, I asked if I could use her beautiful home to host a writing workshop. She agreed, and we’ve been dancing around a date. Last Tuesday, I met with her on her porch, surrounded by all her rocks and books and peace, we shared coffee and dreams. As I always do when I leave the Ripley House of Healing, I make a vow to go tent camping. Cynthia sleeps in her tent outside in her backyard near her sauna. Most people up here in Copper Country follow the Finnish tradition and have a sauna. Ours is downstairs in the basement. But Cynthia is the only person I know who sleeps with heated corn sacks to stay warm in her tent. Because she and her dog Monty even sleep outside in the snow. But, hey, it’s summer (or that moment-savoring time of winter’s coming). On Saturday, June 16, I comforted Jasper, our thunder-stressed dog because the city of Houghton celebrated Bridge Fest with full artillery. As the final fireworks blasted, I promised Jasper it was over. He might not understand why a community celebrates a bridge, but to us it’s connection. The Houghton Bridge is the only one that connects the Keweenaw Peninsula to the Upper Peninsula. It crosses Portage Canal which is a waterway that bisects land, connecting one side of Lake Superior to the other. People have mined copper on the Keweenaw for over 10,000 years. Industrial mining came to the area in the late 1830s. Later, the mines created chutes from the top of the mountain to the Portage Canal below to stamp and deliver copper by way of boats. Ghost towns and abandoned mines scattered across the Copper Country. Cynthia’s Ripley Falls was once an engineered chute, part of the mining. Her house was built 112 years ago, and since that time, Ripley Falls has followed the course laid out for it. A ski resort now spans across Mont Ripley, to the west of her place. Humans have tinkered with the environment heavily in this region, but nature quickly reclaims what was let go. Nature also follows her own course. After Jasper calmed down on Saturday night, I heard thunder off in the distance. I groaned as I walked up the stairs, knowing it would be a long night for the dog. I had no idea it would be a night of terror for my community. Several times thunder woke me up, and several times I fell back asleep. Morning dawned, and nothing seemed amiss. Until I saw the social media posts from Cynthia. All that rubble you see was part of the ski slope above the falls. In a few hours, the thunderstorm stalled over the lower Keweenaw and dumped 7 inches of rain. Cynthia, who usually sleeps where a mountain slammed into her house, slept inside that night. She and her daughter woke up when her refrigerator tumbled over. Water filled her stairwell to the bedrooms on the second floor and pushed against their doors in a torrent, preventing escape. “Drive to be alive: I am alive because I was saved by my 15 year old from certain death in my beloved tent on a night that produced 7” of rain in two hours and a mudslide from an unstable ski hill which slammed against my home burying my yard in 5-6 feet of rubble and muck. I am alive because a first responder and my dear neighbors called for help to rescue my Samantha, my wee pup and I from a home where the flood waters were coming up the stairs from the first floor and keeping the doors shut from the inside. I am alive because a community of neighbors, friends and strangers have poured by the 100’s to my homeplace, to dig through rubble and muck, to lift out treasured photos and sweet memories, to hose down, to kneel and pull out wet insulation from walls, to rip up 112 year old mint condition but wet hard wood floors, to hand pick and haul out sharp rocks from a ski hill burying cars and saunas and garages. I am alive because blessed members if our Ojibwe people came to honor the waters who flow and give us life when we respect the earth and her ways and death and destruction when we forget and are greedy. I am alive with the love of all whom I have witnessed the past days of endless work and give themselves selflesssly to it. And I mean all of you, with thoughts, prayers, financial help, phone calls, ideas, hard labor, food, well wishes. All if this is what we live for. Our purpose in life is to serve one another and create a community of bonds so tight that nothing can divide us because we are bonded in love. Not all is lost when we fall. Those hands reach down to shovel muck with us, to pull us into a hug, push us to rip out our own walls because it’s necessary for survival. Hands join our hands, and together we move all the rubble bucket by bucket from our fallen environment. Hands do their part — some pack, some organize, some bless, and some write. Not all is lost when a community joins hands to lift the fallen. I’ve witnessed amazing acts of perseverance in this community. The Red Cross and government officials lagged behind our local efforts to help friends and neighbors. Our efforts are slowing down because we’ve ripped out all the water-logged walls, salvaged 112-year-old trim, firehosed a basement after cleaning it out by hand, and treated interior framework with sprays to prevent mold. If you are moved to help Cynthia, we do not yet know if her house can be saved, but we’ve set up a fund for her: GoFundMe. We. Because falling takes others to rise. Just as we are a community of writers, we are the ones to extend the hands up. Respond by June 26, 2018. Use the comment section below to share, read and be social. You may leave a link, pingback or story in the comments. 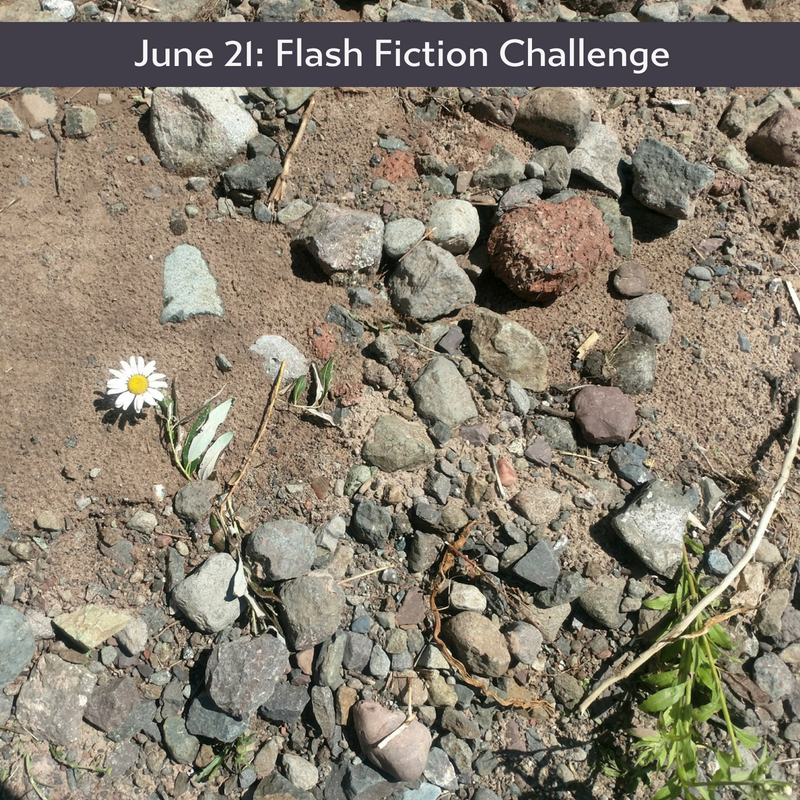 By Charli Mills in Flash Fiction Challenge on June 22, 2018 . Great use of poetic form this week, Di! Your flash spirals downward in despair until these lines: “And a lone flower dares /To raise its head.” Yes! “Dares to” is so powerful. Thanks Charli. I’m glad you liked it. I’ve printed this out for Cynthia. This is a lovely poem, Di. Thanks Robbie. I’m glad you liked it. What a great exercise, to fall and trust someone would catch you! I enjoy mixing artistic mediums because we are all artists exploring what happens in the fall and after. Thank you! Funny, true story. I was in a theatrical production in college. We did a modified kickline where we fell into our partner’s arms with our right leg high over our heads. One day, my partner was distracted. It sure hurt when my head slammed into the stage! Not sure that’s the lesson we’re going for here, but it’s one I remember with clarity. I think acting classes would be great for a writer to take. I love mixing up story-telling mediums and experiencing stories in different ways. Thank you, Kate! When I met Cynthia, I knew I wanted to be friends with her. So many women up here on the Keweenaw embody resiliency. Today I rode shotgun with another friend, a fellow veteran spouse, and we handed out water bottles to the National Guard. I’ve often felt that way about disasters and neighbors, but I’ve experienced such an outpouring of love and support from this community without the mud! I hope Cynthia gets a new yard and tent! But, yes, her home, too. We are all praying for that and what a blessing we both have to live in communities that are There! It is indeed a blessing for us both to have such communities! It lifts your heart and restores faith in human nature when you see such acts of compassion and help. It truly does, Jan! The same people who danced a few weeks ago are now slinging mud. Cynthia laughed, telling me how she grabbed “clothes” and all she could think about in the urgency of the moment was to grab her dance costumes. She’s since rescued her street clothes, too. I may have another brewing about this topic, but the first thing that came to my poetic mind was an acrosTic haibun – a poem. At my post I also have a link to both the Carrot Ranch prompt and a current news article. Down the first four stanza is the word ‘LOSS’ and the stanza at the bottom is a haiku. Perhaps the first acrosTic haiku? I combine different forms. I hope this has captured the community and the strangers who have and will help. This is quite extraordinary. I enjoyed it a lot. The contents of the button tin are scattered across the floor. Ruth sighs deeply. Surely Aunt Deborah’s wedding dress buttons must be here. She examines each tiny, but different, button. Turning them in her hand, hoping to find the final three. At the bottom of the pile there is a tiny gold ring. Ruth remembers the story of the lost Wedding Ring. How the ring travelled from Germany concealed in a coat hem, was lost during a house move long after Deborah had passed away. The buttons would need to be changed or maybe she could use odd ones. I enjoyed how this search for buttons leads to the family migration story. It’s nostalgic and yet an epic story of lost and found in a simple act of sewing buttons. My one Grandma was a seamstress… and I have a tin of her buttons. Button tins are wonderful aren’t they? So many untold and long lost stories in them. My Moms button tin was also passed down through the family. There are sequins from old hatpins and buckles from the 1930’s, a whole host of interesting curios. Yes I think some I have might be old too. And the rainbow colors… I remember playing buttons as a child. I wonder how many were found in the heating vents when my Grandmother’s home was sold? Thanks, Charli. Given the choice, I always seek out humor. Still, against the devastating backdrop of your post, the eruption of nature, the luck and misfortune, all cascaded together in rampaging water and earth boils, well, I hope I didn’t detract from the larger message. We’ve had similar floodwaters up country in British Columbia to name just one first world cauldron. News reports of rising oceans and the threat to close-to-sea-level communities in North America and around the world are incredibly concerning. Take care. I think in order for people to process calamity we need to see it through different lenses. If we only show serious close-ups we don’t see the other effects. Humor gives us a break to be able to process the deeper elements. We are going to need art to get through times that are difficult to make sense of. Despite the increase in extreme weather events, I don’t think many people realize that we need to be adjusting to natural disasters because what was “naturally safe” before is no longer. Ah, I enjoyed your flash! What a harrowing experience you are all having Charli! It sounds like a nightmare — one in which people are bonding and coming together, but a nightmare, nonetheless. It’s been amazing to watch and participate in a community that comes together, Paula. And you’ve captured that essence in a story between two people. In times of trouble, you know who you can lean into. Thank you for donating to Cynthia’s fund, too! Of course! She and Drew were “buddies” in “Guys and Dolls” and I developed a real liking for her. So sorry that she’s the one affected. Cynthia is deeply involved in the community, and the community rose up for her. OK, it’s not letting me reply to your last, but I am very glad that the community has gathered around Cynthia. She’s really a great person. Wow – this one is very complex, and it left me wanting more but still like the story was complete. I loved it!!! I also think “wanting more” is inevitable with 99 words! I haven’t attempted the prompt yet but I am looking forward to it. Thank you, as always, for sharing your stories with us and for always giving us something to think about with the prompts. Thank you, Kay. Yes, things can be replaced. I found out today that one boy who had his bedroom wall collapse upon him has passed away. He was 12. I like to think of those hands from those who’ve fallen into the abyss catching his parents as they must be on their knees in grief. Thank you for sharing your beautiful essay! I know of too many of these types of stories from the firefighters of my family… Yet survivors can rebuild. Charli, your challenge gave me much food for thought and accordingly the offering reflected this. Your post was hopeful and encouraging about the best of qualities that arise in communities in difficult times. Jan, I’m hopeful that communities can bring out the best in all of us. Thank you for giving the topic reflection. I mourn the loss of communities in many places, but, when disaster strikes people pull together. Compassion always surfaces. Thankfully. Community is vital to our wellbeing. Charli, thank you for sharing your experience of falling in the snow. I could visualize you letting go down, but not panicking. How beautiful it is that you just relaxed and let go, go with the fall. You got up with a helping hand. What a good example of community support. It could have been worse if we fall and struggle about falling. It’s not easy to let yourself fall, physically or metaphorically. During my cancer treatment, I was down to skin and bone and my life was failing. I too let go of my responsibilities and accepted help from my community to let my body heal and recover. My best friend’s parents almost lost their house in the NorCal fires of 2017. We prayed really hard as the flames came toward them. This story reminded me of God’s grace and provision, as he stopped the flames from coming to their house even though the neighborhood was destroyed. I’m glad your parents house was safe. My friend’s son teaches in that area. Many major buildings of the school were burned down. He stayed behind to help the students and their families. The freeway was blocked off. His wife took the three kids and drove through the side street for 120 miles to come staying with my friend. It was a scary time, but God is in control. Glad they were ok! Fires are scary. Yes, the Santa Ana wind comes every year. Miriam, isn’t it amazing how when we finally let go and fall, that’s when the healing can begin? You’ve had a tough fight back from cancer, but you’ve managed it with grace. Thank you for sharing your understanding of falling. It is always good to have hands up. Wow, your story of the 2017 fires is powerful. The sheer numbers alone are hard to fathom, but when you add the details of the photos pinned and decorations strung, you give us that image of recovery. Yes, I cried when I listened to those people being interviewed and videos of them coming back to their burned home, yet with hope and good spirit. A lovely piece, Miriam. It makes me feel hopeful. Oh my, Charli, from your fall to the falls’ fall. What a metaphor. Yes, we do need those hands to help us up when we’re down. You may have been able to see your snowy fall as a snow globe, gently shaken up by another far away. But it’s difficult to see this muddy fall in the same way. I was interested in Cynthia’s comment about the ‘Ojibwe people (who) came to honor the waters who flow and give us life when we respect the earth and her ways and death and destruction when we forget and are greedy’ and wondered how respect had not been shown. Sometimes we take our own power for granted, as if we can control our world. But nature has a way of reminding us who’s boss. I like the way you take up that theme in your flash. You pull together all those threads quite nicely in a piece that speaks succinctly and with clarity of greedy-mindedness and its effects. I am amazed that Cynthia sleeps outside each night in a tent. She is obviously one special woman, with a special way of interacting with her world. It’s a good thing she slept inside that night. Perhaps her relationship with the earth told her that was what she needed to do. I am pleased she is safe and that not all is lost. That is a good thing about the human spirit – hope, it’s what keeps us going and get us up when we fall down: spirit and a helping hand or two. Best wishes to Cynthia and others who must also have lost a lot. Hi Charli, I’m back with my story this week It’s not the end of the world https://wp.me/p3O5Jj-1aF Best wishes to you, Cynthia and all your neighbours affected by the storm. Not the end of the world after all! (Here, too.) Thank you, we are cleaning up and puzzling out how to get old mining infrastructures rebuilt as they became our roads and waterways. Hmm. We are but pawns in Mother Nature’s game of chess. I think she’ll always win, no matter how powerful or in control we think we are. Norah, it is a muddy fall muddied more by the fact that the ski hill on Mont Ripley built a new run which came above Ripley Falls. Cynthia spoke out against it. She was told they put erosion skirting in place — that didn’t hold! Now we are finding out that the ski hill did not secure proper permits, either. These are issues that Ojibwe and other native peoples are fighting in the US, and they are focusing on water all across the states. A group of Ojibwe women came up to Ripley after the landslide and held a water ceremony with Cynthia. Tonight when I was out there, I saw the big trucks hauling away the debris field of rocks from the slide and they are taking it back up to rebuild the sloughed hillside. It seems a poor choice. But Cynthia has a lot of fight in her, and she’s advocating for them to manage it correctly. Yes, the community is surviving with that strong human spirit. Thank you! Good on Cynthia. I hope they get it right this time. Thanks for filling me in. Just because they’re a figment of your fertile imagination doesn’t mean they’re fictional. AAUUUGGHH! My brain. Terrible thing to lose. That should be Drake not Riley. No explanation. No excuse. Please fix. Ha, Ha! Changed it to Ripley — for her Ripley Falls, lol! Oh, Jules, I’m loving your acrosTic haibuns, loss, and gains. Thank you for sharing these. I’ve placed them in Cynthia’s binder for her. A great deal to think about in your post, and in the comments, stories and poems. My prayers for Cynthia, and the community, for courage to build anew, and to keep moving forward. On a somewhat different note: I think it was either Edison or Bell, who said that “failure is the mother of invention”. My idea for my FF story in response to “not all is lost” came from my reading the biographies of women scientists, trailblazers in their fields, very determined and courageous women. Thank you, for a challenging and inspiring post. Thank you! How amazing! Thank you for sharing the news story about the Susquehanna rock drawings, and the efforts to record/save the drawings. Never expected the FF to be so completely transformed by a real story! Yes, all is never lost, and it is stories that ensure that. Thank you. Cynthia and our community are pulling through. We got to swap stories tonight at the fire hall and it seemed such an ancient thing to do after coming together in a crisis. I enjoyed your flash that honors the pioneering spirit of women in science. Of course, I also enjoyed the story-cathing and book sharing elements, too! With dark holes eating the sun and planets, yes, devouring would be a concern! I enjoyed your sci-fi twist on the prompt. I’m intrigued to read your mash-up, Sarah! Hopefully, my request to gain entrance was not lost. 🙂 Sorry to hear you are having spammer issues. I use Askimet and that filters spam. I did that too for about a week or more. I’m still getting stalked by a ‘follower’ who I do not want at another site…. You reminded me of a time when some folks I knew kept a gun under their pillow – so to speak- but thankfully were not woken when robbed. I think the ‘loss’ would have been greater if they had been woken. How dreadful your friend, Charli, but what a lucky escape that she wasn’t sleeping in her tent. The devastation caused by floods is so demoralising, and seems to be on the increase, at least here. Lovely flash to round it off – life goes on because it has to! Beautifully evoked. Anne, I think floods are becoming more prevalent as we built where we don’t often have such events. With climate change, a signature is that weather events become more extreme. They are calling our flood a 1,000-year flood which really conveys no real meaning to me. I think they say things like that to imply another won’t happen again for a thousand years. As for the cave, I was delighted to find you went there and reflected on the hero’s journey! My response isn’t nearly as poignant as this wonderful post. I hope you don’t mind. It’s all about the bouquet that comes together, Allison! Thank you for contributing! Even from a distance, it’s surreal to watch a loved one’s world come apart like that. Her house is absolutely gutted. I had a workshop scheduled there and she pulled the Rough Writer’s Anthology out of the mud. I feel like I’m right there, too. The community has been amazing and many are letting me collect their stories. Some have twists as amazing as what you write! An appropriate flash for the Copper Country, Kate which has known many previous disasters in the manner by which you weave your tale. Are you up as late as I am, lol? It feeds my writer’s soul to read each story here and revel in how different styles and perspectives can be to shape the big picture of a single topic. Names have power… so it has been said. For some people I believe they really do. Sorry, put my personal comments on the submission form. I know you’ll get them. I’m sorry about Cynthia’s troubles. Where you live demands you all be warriors….. Thank you, Susan. And I agree with your flash — we often have more to gain as writers when we let go of expectations and savor reading and writing for pleasure. I hope your character finishes reading and feels invigorated! I haven’t written in awhile. 4 kids on summer break can make it hard to do anything for myself. Add the World Cup on tv and it makes it almost impossible. Here is my submission for this week. O, mama! Four kids on summer break! Enough said — but think of the stories you’ll have later. 😉 Certainly, there are days when wine saves it all. Good one, Heather! I feed the ones that live near our house. They know to come beg at daybreak and will come when I call them. My hubby thinks I’m crazy. Crows are among my favorite birds. I’d rather be a crazy crow lady than a crazy cat lady, lol! Colleen, I enjoyed the dilemma and the pun in the last line ads a fun vibe to the flash. Gosh, Susan, is this a BOTS? I was in a light airplane that had to emergency land on an agricultural runway in the middle of no-where once. I heard that saying you quoted then. Yes. This happened to an Air Force friend of mine. He added, “My crew then had to go fly after watching that.” Heavy stuff. Oh, wow, Susan! Can you imagine flying after just witnessing that? Yes, it adds meaning to the saying. Thanks for capturing and sharing his story! What a moving post, Charli. I hope things are slowly coming right for Cynthia. I’m sure they are. My offering this week is something I had totally forgotten about until I read your post. A definite BOTS which happened when we lived on a tiny Carribean island in what seems like another lifetime….All is certainly not lost while we’re still standing and breathing. A great response, Juliet. I have been in a situation like this and it is very scary. Thanks Robbie. Very scary indeed. So scary that I had completely wiped it from my brain! Thanks, Sherri. I know, it is amazing what 99 words can drag out of our memories. That episode had been put in a little drawer and locked away for years. Amazing how your buried memory came to life, Juliet, and what you were able to do with it in 99 words. The last line says it all. You got away with your life! Hi, Charli. Thanks. Yes, that episode was definitely buried. But I now wonder if the gun was real or not. But glad I didn’t have to find out! You reminded me of a time when I was driving… in our state you can turn right on red if there is no traffic (doesn’t mean you have to) – I hadn’t – and the car behind me wasn’t happy. When the light turned green ‘he’ followed me! I should have gone straight to the local police station, but I found a cul-de-sac and turned around. When he followed me in… I just floored it out – and took a longer route home! Great characters in this unfolding saga of place and living as you are. I enjoyed the message of the second chance in your flash Robbie. It will be a fresh start for my friend, Robbie. She lost everything and insurance will cover nothing. We’re all rallying around the flood and landslide victims with fundraisers and sharing furniture and donating time and skills. Community is not lost and she’ll be okay. Better than okay. Thank you! Your story shows that people as well as our expectations of them can change. He hit rock bottom and I thought it was the end. “If you keep drinking, you’ll be dead in six months,” warned the doctor. I was wrong; he stopped, for a few months at least. Then he started again and I knew his next fall could be his last. I wondered if spending nights hunched up in a doorway might change things, or late night rants down the telephone cursing his dear, beloved father who he hoped would rot in hell. It was the years in prison writing letters to his daughter that told me, all was not lost. I liked this a lot, Sherrie. A powerful message. Sherri, you have a huge heart for those to whom Tolkein’s observation applies. You find the wandering as displayed in your poignant and touching flash. Rock bottom still has an up, especially when someone reaches out. I pray Cynthia’s life comes back to normal. You are such a compassionate soul, my friend. I admire you for always being there. My take is on a lighter note….just to give a smile in times of adversity. “I’ll have the butterscotch, please!” Meghan requested politely. “I’m sorry, I can’t decide,” she said as she put her index finger in her mouth and swayed her 4-foot skeleton from left to right allowing the frills of her frock to bend along. “Next,” he shouted leaving her cup as is and attended the next person in line. Thank you, Ruchira. I find lots of great souls in my life, including you! I think we caught the tail end that midwestern soup! Usually, Lady Lake pushes the humidity out but she let it in and I was melting. It’s cold tonight, though…ahhh…! Love the word, squatching!